There’s yet another budget priced option available in the variable voltage advanced personal vaporizer (APV) market, and like the Smok Tech gripper we recently reviewed, this one also takes the gripper form. Price is not often the first thing we talk about, but in this case it is necessary to keep in mind that this is a very inexpensive APV. 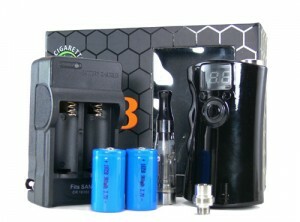 At $54.95 for a complete kit, the Ovale V8 is one of the least expensive variable voltage devices on the market. 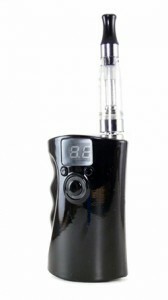 The gloss black Ovale V8 Kit purchased from Smoktek for this review includes everything needed to get started with the exception of e-liquid. The kit contains the Ovale V8 body, two 18350 batteries, a wall charger, CE4 clearomizer and eGo adapter all packaged in a flip top box. There is also a manual that might as well be discarded for reasons we’ll get into shortly. 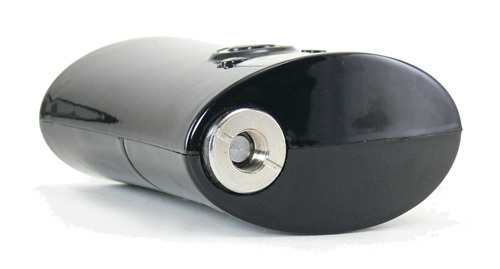 The Ovale V8 has the appearance of a standard gripper mod, which is to say that it is boxy, but with rounded contours and indentations for fingers along one side. Buttons are located on the front just below the two digit LED screen and a 510 fitting is found on the top. The device is lightweight at only 3.5oz with batteries installed and is comfortable to hold and carry in a pocket. The arrangement of the grip and fire button make actually gripping it a little awkward. 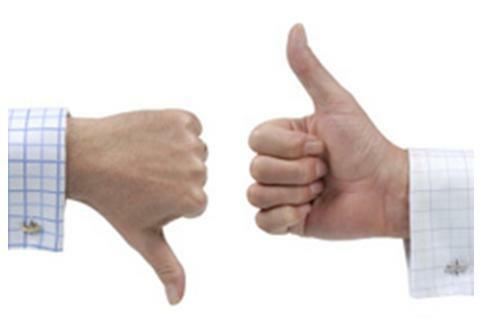 The thumb has to be bent at a fairly sharp angle in order to press the button. Simply resting it on the fingers and pushing the button is quite comfortable, though. The device has a good solid feel and the gloss black finish is attractive and looks as though it should hold up well. 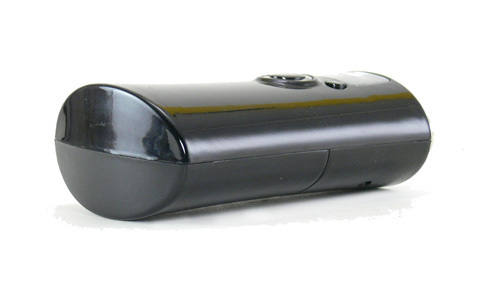 The bottom and top of the unit are slightly rounded, giving it a sleeker appearance as compared to a typical box mod. The rounded bottom and slightly rough edges where the two halves of the body meet make it a little wobbly when placed standing up, though. The batteries make it bottom heavy, so even though it actually stays upright better than most longer APVs. The power button has a nice firm feel to it and a blue ring that lights up when it is pressed. The red LED also lights up with the set voltage output and cannot be turned off. The fire button also turns the unit on and off when clicked 5 time rapidly. Interestingly, the manual advises to press and hold the power button to accomplish this, which is incorrect. The two buttons above the fire button increase and decrease the voltage – in that order. The left button increases voltage and the right button decreases it. Exactly the opposite of what one would expect. The battery compartment is one area that is not engineered well. The length of that compartment is less than an 1/8″ longer than the batteries themselves and the spring on the negative end is around 1/4″ long. This coupled with the fact that the batteries sit well down inside makes it a real challenge to get them in without bending the spring back. Getting them out is quite a bit simpler due to the fact that a strap has been added to pull them out with. The battery door secures well with a plastic latch, but care should be taken to make sure that latch lasts as long as possible. Here is the area that the bargain price of this device is most evident. When a device has several buttons and an LED display, it might be assumed that additional features are accessible. Not so. The buttons consist of two small ones for voltage up and down and one large one to engage the atomizer and turn the unit on and off. The LED shows the set voltage. That’s it. No atomizer ohms and no battery charge. I didn’t really expect this device to do everything, but found myself really missing the ability to display the battery charge. Just how much more expensive would that be? The display does display a “Lo” indication, but only after the batteries are nearly exhausted and unable to supply sufficient power. The output voltage of the Ovale V8 is quite similar to that of the VMax in that it feels quite a bit higher than it is. A 1.7ohm cartomizer performs nearly perfectly at the 3.0volt setting, feeling more like it would at around 3.7v. Once set, however, the voltage stays steady throughout the battery charge. Also like the first run of the VMax model, the unit defaults to 5v when the batteries are replaced. Users are advised to be careful about this fact, because the V8 will also willingly fry a low resistance atomizer or cartomizer at 5v. All things considered, the V8 is a great vape. There is plenty of power to drive even low resistance cartomizers making for a nice warm vaping experience. The 5 click on/off and rounded shape make this an easy device to carry in a pocket or purse and it’s comfortable to use. I’m actually finding this to be a very enjoyable device to carry around with me. I always feel like I have to be too careful with more expensive devices when in the garage or on the bike. At only $29.95 for the unit itself, I think I have finally found a variable voltage device that I don’t mind taking some chances with. A few design shortcomings prevent the Ovale V8 from being a contender for the variable voltage big leagues, but sometimes cheap is good in its own right.